Finding a subcompact crossover that can help your family stay safe might be a bit of a struggle. 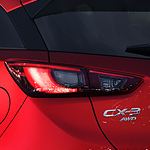 Come by Brunswick Mazda and let us show you some of the safety features that can be found in the popular Mazda CX-3. Drifting out of your lane can be a problem if you often drive when you are tired or if you tend to get distracted while you are driving. Drifting out of your lane can be dangerous. The Mazda CX-3 has a warning system that it can use to let you know that you are drifting and that you need to pay more attention to the road. When you are backing your vehicle up, there are all kinds of bad things that can happen. The Mazda CX-3 has a system in place that can let you know if a vehicle gets into your way while you are driving in reverse.